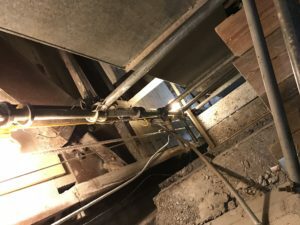 Isaac Blair worked for Gilbane Building Company at One Beacon Street to install a staging system inside an 8’x 8’ duct shaft from the 12th to the 36th floor for electrical and masonry work. The biggest challenge was building a shoring system to support the staging and accommodate the existing piping, duct work, and brackets. Few structural components existed in the shaft to work from, but Isaac Blair creatively installed a strong base to support the entire system. This was not an easy installation and the crew met the challenge with a great attitude and excellent execution. They took great care to not damage walls in finished spaces, kept their lay-down area clean and well organized, and left their work areas cleaner than when they arrived. The scaffold itself exceeded my expectation, especially regarding the thought that was put in to accommodate the other trades utilizing the scaffold, and keeping the other trades safe.